Dylan Thomas Boat House Heritage CentreDylan Thomas was one of the greatest writers from Wales and a giant in the 20th century. The most renowned in a school of Anglo-Welsh writers that flourished during that period. He made particular use of the, then, new mass media technologies of broadcasting and recording. Dylan Thomas was born in Swansea but his family roots were in Carmarthenshire and it was this county that provided him with a constant source of inspiration. He lived at the Boathouse for the last four years of his life during which time many major pieces of work were written - including Under Milk Wood. The Boathouse, where Dylan and Caitlin lived with their children, Aeronwy, Llewelyn and Colm from 1949 to 1953, is now a heritage centre. The house now contains audio visual presentations, original furnishings and memorabilia, a themed bookshop, tea room, viewing platform and terrace. Dylan Thomas was one of the greatest writers from Wales and a giant in the 20th century. He lived at the Boathouse for the last four years of his life during which time many major pieces of work were written. 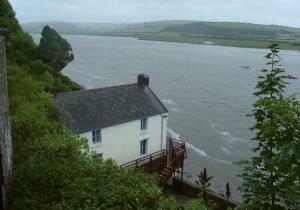 Laugharne is easily accessible by car and is approximately 30mins drive from the end of the M4/A48 in Carmarthen. From Carmarthen take the A40 to St. Clears then the A4066 direct to Laugharne. Free parking is available approximately 10 mins walk from the Boathouse.